When you're looking at the bare walls of your extension the choice in the back of most peoples' minds is probably plaster, then paint or wallpaper. But there are lots of different options as well. Firstly consider having a natural finish. If the rest of the house is made of a particular stone, for example, consider bringing that inside. It might seem a bit cold but you can use it on just one wall as a feature. It should be a dual-skinned insulated cavity wall anyway and with the rest of the extension built to modern insulation standards it should be easy to keep warm. Even a brick wall can make a difference. Using the external features of the house in an extension helps bridge the gap between internal and external, very useful if the extension is at the back and connects the house to the garden. Be careful not to emulate the feature stone chimney breast idea popularised in the late 1960s and early 1970s, there's a reason why that fashion died out. Tiles are an option too, but not just ceramic tiles as used in kitchens and bathrooms. Larger tiles are available in a huge variety of stone, marble, limestone and travertine finishes that look very upmarket if balanced with other wall finishes. Larger tiles can be placed horizontally, making a room look larger. Glass and mirror tiles can also be used to great effect in extensions, they aren't just for kitchens and bathrooms. Because they are smaller they can look very fussy on huge walls so think about using them in small panels or strips. Use complementary or contrasting colours on the other walls. The same applies to metal tiles. They can be found in satin, gloss or matt finishes in colours like gold, silver, bronze or even black. These can lend a hint of class to a wall but because of their size and dramatic effect they are best used as highlights. If you do decide to plaster it doesn't have to be a plain finish either. Although it's not easy to find professionals who can do it, it is possible to produce a number of different textured finishes. Plaster can be worked with a trowel to give a rustic finish which again helps to blur the lines between the garden and the home in an extension to the rear of a house. Plaster is amazingly versatile and can be dragged, pitted, and coloured in the hands o a real professional. One of the most dramatic finishes is polished plaster, also known as Italian or Venetian plaster, which is very lustrous indeed, often with marble dust mixed in. It is a technique used to great effect in classical times and coloured and lit by recessed lamps it can work wonders on a feature wall. So there are other options for you to use on your extension walls. 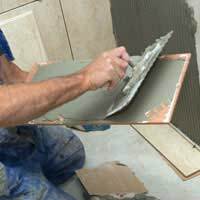 Granted they will all be more expensive than plaster and paint or wallpaper, that's the main reason why most houses are finished in that way. But some of these options aren't that much more expensive and if used sparingly as features they can dramatically lift your new room. Re: When is an Annexe Not an Annexe?